Interest in understanding the role of the operating room (OR) environment in transmission of surgical site infections (SSIs) has increased greatly in recent years. Numerous studies have shown that standard cleaning practices leave significant levels of contamination on OR surfaces and can contribute to SSIs, the most expensive hospital acquired infection (HAI) to treat. Xenex Disinfection Services’ patented pulsed xenon Full Spectrum™ ultraviolet (UV) disinfection technology has been proven to quickly destroy the viruses, bacteria, mold, fungus and bacterial spores in ORs that cause SSIs. Traditional cleaning practices leave behind dangerous pathogens such as Clostridium difficile (C.diff), methicillin-resistant Staphylococcus aureus (MRSA) and vancomycin-resistant enterococci (VRE). A study conducted at Cambridge Health Alliance, a Harvard Medical School Teaching Affiliate, demonstrated that pulsed xenon UV light disinfection can significantly decrease OR contamination. The study showed that Xenex’s germ-zapping robot reduced surface contamination in the OR by 81 percent, and that while between-case contamination in the OR continued to rise from case to case with standard cleaning, it was reduced to almost zero when the Xenex robot was used between cases. 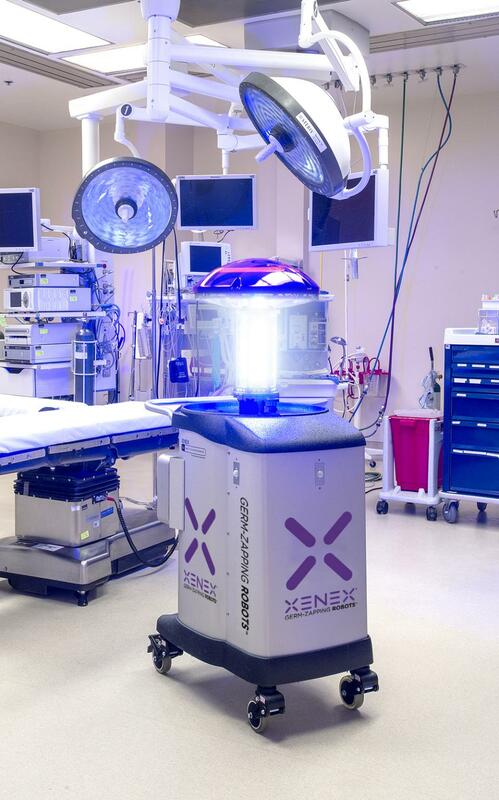 Xenex will demonstrate its germ-zapping robot at the Association of Perioperative Registered Nurses (AORN) Surgical Conference & Expo in Denver, CO, March 7-10, 2015. Hospitals using Xenex for OR disinfection will discuss how they are eliminating the microorganisms that cause infections and make patients and healthcare workers sick. Xenex has teamed up with AORN to host an educational session as part of the AORN Leadership Development series. On Tuesday, March 10, Julie Tonsager, OR Team Lead at St. Cloud Surgical Center, will share the facility’s two-year journey in evaluating UV technology. She will discuss the steps they took to ensure a successful implementation in their ORs. Uniquely designed for ease of use and portability, a hospital’s environmental services staff can operate the Xenex robot without disrupting hospital operations and without using expensive chemicals. With a five-minute disinfection cycle, the robot has helped disinfect 30-62 hospital rooms per day (according to Xenex customer reports), including patient rooms, operating rooms, equipment rooms, emergency rooms, intensive care units and public areas. More than 250 hospitals, Veterans Affairs and DoD facilities in the U.S. are using Xenex robots, which are also in use in skilled nursing facilities, ambulatory surgery centers and long term acute care facilities. There are now ten peer reviewed studies confirming the efficacy of the Xenex Germ-Zapping Robot™ in the healthcare environment, including three studies showing a decrease in C.diff, MRSA and MDRO infections when the hospital used the Xenex robot for room disinfection. Xenex’s patented pulsed xenon Full Spectrum UV room disinfection system is a pesticidal device used for the advanced cleaning of healthcare facilities. Due to its speed and ease of use, the Xenex system has proven to integrate smoothly into hospital cleaning operations. The Xenex mission is to eliminate harmful bacteria, viruses and spores that can cause hospital acquired infections in the patient environment, and to become the new standard method for disinfection in healthcare facilities worldwide. For more information, visit www.xenex.com. This entry was posted in Environmental Safety Products in Healthcare and tagged C Diff Awareness, Clostrideum difficile, Healthcare, Healthcare-Associated Infections, MDRO Infections, MRSA, Xenex, Xenex Disinfection Services on March 6, 2015 by cdifffoundation.